Please note we will be temporarily closed Thursday, May 29 at 3:00 p.m. and will reopen Friday, May 30 at 9:00 a.m. During this time, please visit one of our other two Manhattan locations. 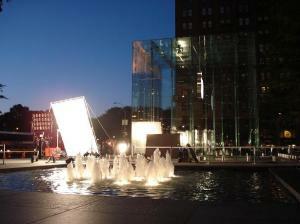 Employees are telling passersby that a commercial is being shot at the 5th Avenue Apple store. 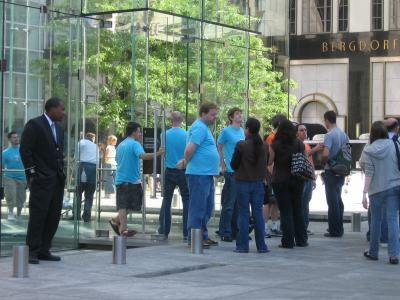 We've been told that Apple's 5th Avenue store has only been entirely closed twice in its history: the iPhone launch and the Leopard launch. According to MacRumors sources, Apple is actually filming a commercial for the upcoming 3G-capable iPhone with filming to occur inside and around the 5th Avenue store. 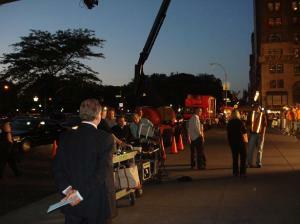 TheiLife posts photos of lights are being set up for filming. The site appears to be down, all photos are mirrored here. Logical explanation for 'Anonymous 5+4' boxes (also confirmed by another report that these simply represent walkie talkies). Alternative (humorous) explanation. Silicon Alley Insider posts a few of their own photos. First hand account of some of the setup. thechidz reports "I just walked by and they are still shooting and not letting people even cross the street" (~12 midnight). Photos from across the street.